Trimming Router Bits are made by Amana Tool, the leading manufacturers of high quality wood cutting tools. 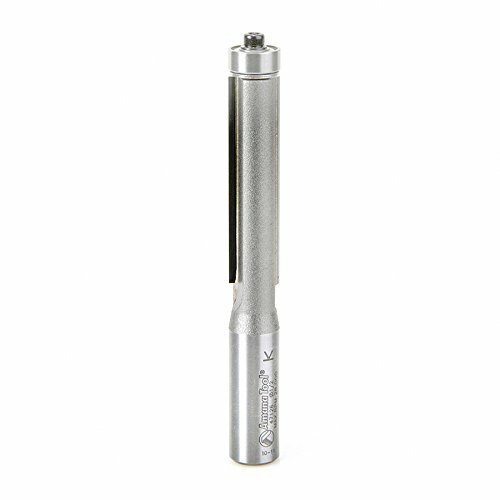 Use Amana Tool 47126 Carbide Tipped Flush Trim 1/2 D x 2 CH x 1/2 SHK x 4-1/4 Inch Long Router Bit w/ Lower Ball Bearing for laminate work or for template and pattern work. For template application, the bearing follows the template, while the cutting edges trim the workpiece. SPECIFICATIONS: Diameter (D): 1/2; Cutting Height (B): 2; Shank (d): 1/2; Overall Length (L): 4-1/4; Replacement Bearing: 47706; Flutes: 2.